To anyone who grew up in Melbourne, Slades’ home-delivered soft drinks are an institution. Established in 1867 by brothers Thomas and Frederick O’Neil, the company traded as O’Neil Brothers Soft Drinks until 1930 when the beverage producer took on Slades (from Frederick’s middle name) as its moniker. Today the company is run by the Tan brothers George, Ben and William, and their father Michael, who took it over in 2001. Here, George Tan talks about how he and his family took a business in decline and turned it into a thriving enterprise with a progressive and innovative outlook. Part of Slades’ progressive outlook involved looking back and taking up what had worked well in the past and building on it. “In 2001, when we took over the business the home delivery service was very weak,” says George. “We’ve found a lot of nostalgia for the brand; people from Melbourne remembered it. In 2008, we relaunched home delivery with 10 to 12 trucks and we deliver all over Melbourne. Slades is also still selling in milk bars and convenience stores in Melbourne and we also have a factory outlet. “When we bought the business the O’Neills stayed on for a while to help us gain a better understanding of the business. The first 12 months after we took over were hard. There were quality issues, inconsistency with product. We had to change all of that. We looked at the manufacturing process and improved it. “Before we worked with ALDI, our practice was to use only cardboard cartons. ALDI wanted to eliminate cardboard cartons by using the CHEP Multi-Purpose Beverage Trays and Display Pallets. From our point of view it was a good move. Using the beverage tray we do not have wastage through damage from cartons. “Also when using cartons you need different cartons with different bar codes for different flavours; with the CHEP Multi-Purpose Beverage Tray and Display Pallet, you can visibly see what flavour it is – and we do 10 different flavours for ALDI. It saves costs because it eliminates the need to print different cartons and also saves us time because we don’t have to stop the line to change cartons. Slades installed a new line in to meet the demand for its third-party retail orders. The process is largely mechanised and works seamlessly with the CHEP Multi-Purpose Beverage Tray and Retail Display Pallet. A robot picks up 48 bottles, the number that fills two Multi-Purpose Beverage Trays, and places them on the tray. 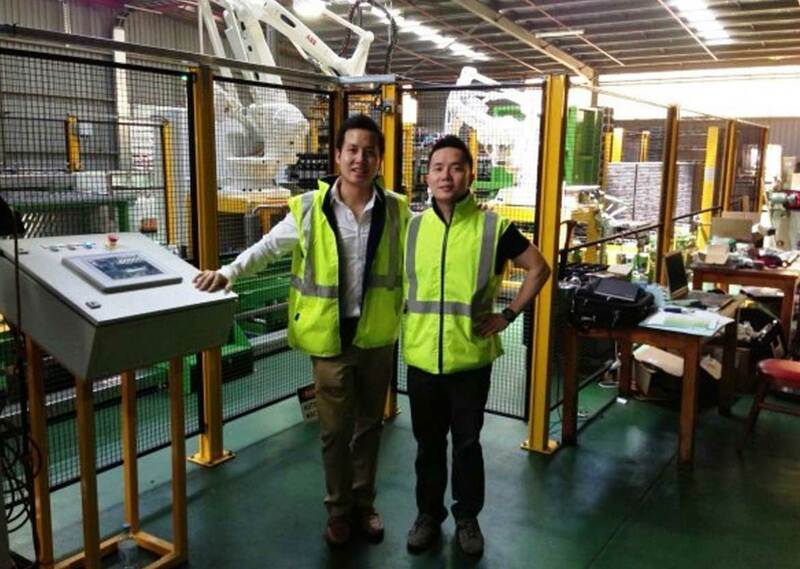 Two robots then pick up the trays and stack them on a Display Pallet (which is exactly the size of two Multi-Purpose Beverage Trays and one third of the footprint of a standard wooden CHEP pallet). When the stack reaches five high it moves down the line for wrapping. The process is twice as fast as hand-stacking, achieving an average output of 100,000 bottles a day. “Installing the new line has been worth it. The robots can pack all of the ALDI bottles into a Multi-Purpose Beverage Tray then onto Display Pallets, and where we still use cartons for some customers it can also automatically pick up and stack them onto a traditional CHEP pallet. Previously this was a very manual process. We can switch from cartons to Multi-Purpose Beverage Trays and Display Pallets anytime to meet our customers’ needs. “Switching to using the Multi-Purpose Beverage Tray and Display Pallet opened up a market opportunity for us. When the soft drinks come off our line it’s a retail ready product – it goes straight to the store – that’s what we really like about it. “I like that there’s high visibility of the product. It’s just in your face. Customers can see the label and touch it, it just stands out.